This wasn’t my first time at Ormsby’s. No, that first meal can best be recalled as post concert blur of parrotheads and oddly chilly April nights. This time was different, it was a late lunch in early July and I was meeting Jennifer before I began the trip back to Jackson. Ormsby’s may seem like an odd choice for that time of day as there was no time to explore the beer menu or take in a game or two of bocce, but truth be told, there aren’t a lot of quality options at 2:30 in the afternoon. Running late for my departure or not, time was made for an order of beer battered pretzels. 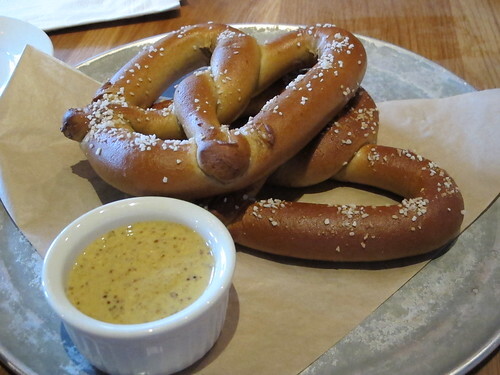 Dipped in beer and sprinkled with sizeable salt crystals, this was a fine pretzel, very tender and doughy. 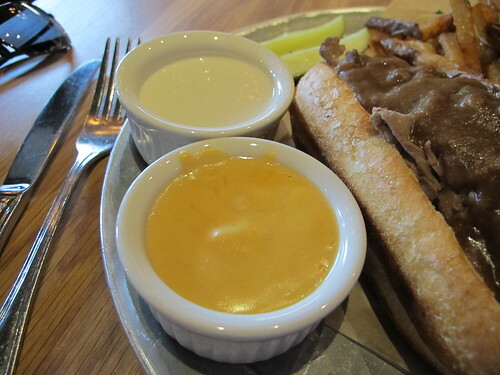 Of course, no pretzel is complete without a side of mustard and Ormsby’s serves a pungent one. Any worries of congestion were vanished with liberal applications of mustard on pretzel. 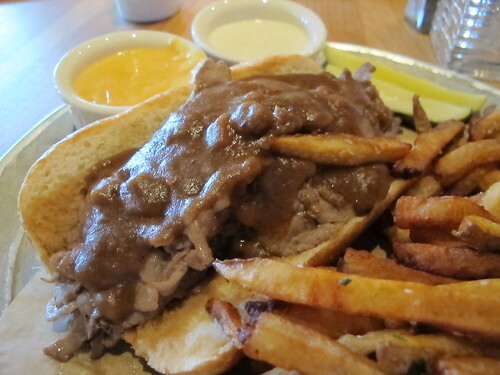 Although the Bruno Burger with its half pound of grass-fed beef was tempting, I had to try Uncle Lenny’s Shaved Roast beef if only because the description mentioned pot roast gravy. Served with a pile of fries and choice of two dipping sauce, it was just the light lunch I needed for the six hour drive west. The fries at Ormsby’s may be well salted and quite numerous but their limp, flaccid texture made them go largely untouched. topped with plenty of rich, but oddly congealed gravy. 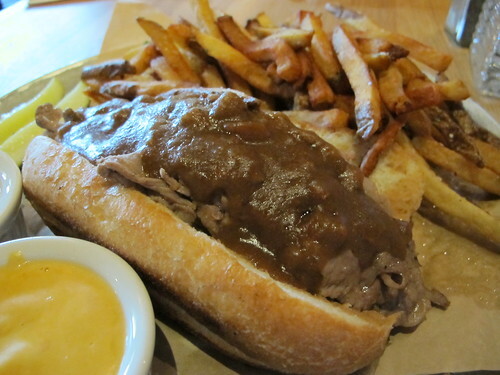 Like you’d expect from this amount of beef and gravy on such a small hoagie roll, spills were inevitable but they didn’t detract from what was a simple but damn tasty sandwich. If I had to single out just one positive attribute of this surprisingly delicious homage, it’s that this cheese made the disappointing fries worthwhile. 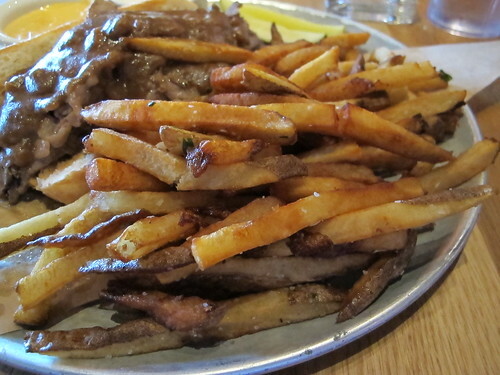 Limp or not, the well salted Ormsby’s fries with their homemade whiz is a match made in beer fueled heaven. 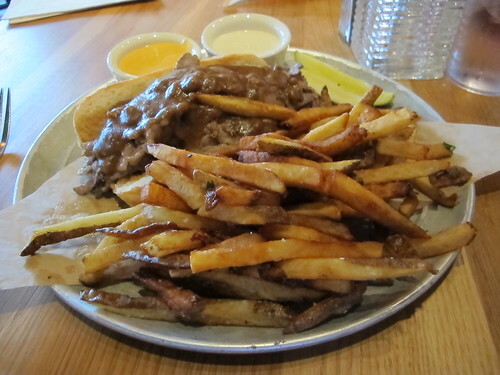 While Ormsby’s may be known for their bocce, darts, and multitude of other beer hall games downstairs, it’s comforting to know that a meal of quality bar food is always available, even if you wait till three in the afternoon to have lunch. It was my last night in the city and I was looking for something different for dinner. Plucking an idea straight from the bowels of food related television, I decided to try and pay a visit to Brick Lane Curry House, home of the infamous phaal curry, a curry so hot the cook has to wear a gas mask when preparing it. I had my reservations made on open table and I was ready to go the nearly 40 blocks to dinner, it was just a matter of catching a cab. 30 minutes later I had blown my dinner reservation and any bit of patience I had left, I couldn’t catch a cab to save my life. Luckily, just then, a friend called to see if I was still up for meeting for dinner. So, I retreated to the Algonquin lobby and waited for Anne Marie to arrive. A half hour later, we were on the way to dinner. Hoping to show me a new cuisine, Anne Marie had a certain place in mind. After walking through Times Square, we quickly arrived at Braai, a South African restaurant named for the local term for barbeque. I’ve been told that South African cuisine is hard to peg, nicknamed the "rainbow cuisine" it seems to be a mixture of a variety of other cuisines, Indian, native, Dutch, Portuguese, etc. Luckily most everything on the menu, foreign name or not sounded quite appetizing. Hoping to try a little bit of every category, we decided to try a few different appetizers instead of one or two big entrees. That order in, the first thing brought to our table was an order of the frikadelle. Essentially a beef and lamb meatball in a hearty sauce, this was a tidy order of well cooked and very well seasoned meatballs swimming in spicy tomatoes. With a very fine texture and a pleasant residual heat, this was a precocious start to the meal. 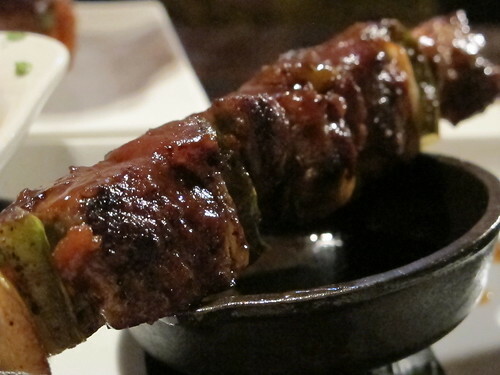 Next was a dish from the mini-sosaties section of the menu, the skewered mutton. 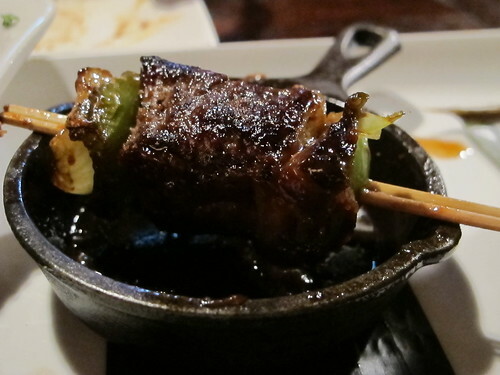 Beneath the thick sauce and taste of Cape Malay spices, there was a nicely charred, but overcooked piece of mutton. 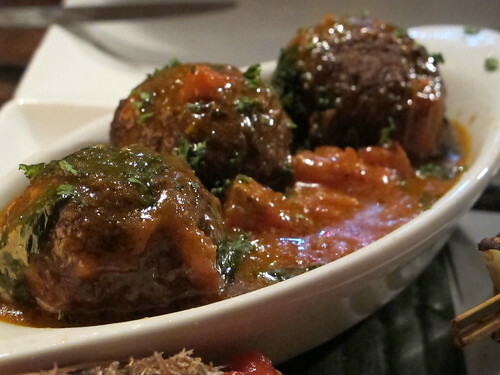 I realize that mutton will never be at tender as lamb, but even with the excellent flavors, this was hard to eat. Being a traditional pork and beef farmer’s sausage on a roll with onions and tomato sauce, it had the makings of a great sausage sandwich. 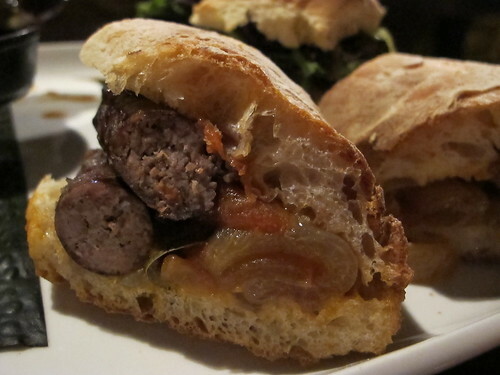 Sadly, the flavorful and surprisingly spicy sausage had been overcooked as well. As good as it tasted when cooked to death, I can only wonder how it would taste if cooked properly. Looking to try meat that’s a little out of the ordinary, we ponied up the extra four dollars for the ostrich braai burgers. 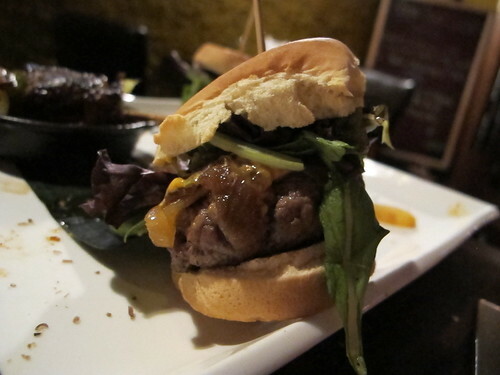 It was a nice pair of small burgers, well dressed and looking quite appetizing. Unfortunately, the lean ostrich suffered the same fate as the much fattier sausage. What would have been a perfectly tasty burger was a wasteland of overcooked meat, nice toppings though. 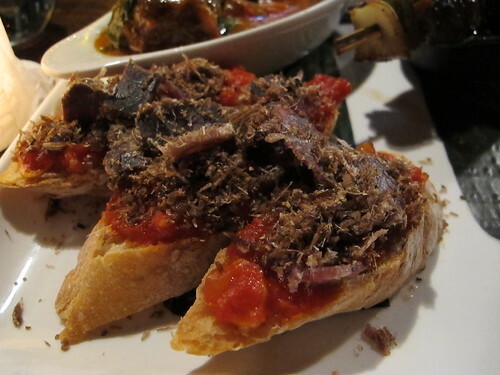 The last dish could be best described as a beef bruschetta. With a texture akin to chipped beef, this tomato and beef dish was on the salty side but still satisfying with a big beef flavor and plenty of fresh tomato. Ideally with so much overcooked food, I would have told our waiter about the problem and it would have been rectified. Oddly, our waiter seemed to disappear after he brought the food, only pausing to tell us that the kitchen was closing and to see if we wanted to order any other dishes. So with the kitchen long closed and our meal finished he reappeared and after hearing about the food, only offered an odd commiserating story about how the kitchen staff would mess with him by making his staff meal order of meatballs extra greasy. Not knowing what to do with that information, we paid the bill and left. It’s a shame that Braai was so disappointing. There were excellent flavors at work and so many biryanis, prawns, and steaks that we didn’t have a chance to try, but if they made such a hash of the appetizers, I wouldn’t hold out much hope for the entrees. It looks like the next time I’m in New York and looking for something a little different, I’ll be better off skipping this South African outpost. It pays to have friends in the city. Case in point, I can do hours and hours of research and I know that there are countless restaurants that I will simply never come across on my own. Luckily, a few friends of mine have done the legwork for me. That’s why, one Friday night, I was in a cab with Alex and Sarah on the way to, what looked like Katz’s Deli. When we did stop in front of the landmark delicatessen, I was surprised but even more so when we then walked past it, down Ludlow Street and finally ducked into a hole in the wall named Trē. Inside was the howl of air conditioners, the gale force winds of the fans, and the dull roar of a large crowd enjoying the wine bar. Once we were seated, the candlelight atmosphere in this wine bar may have been quite romantic but it was frankly a pain to read the menus. However that minor annoyance quickly turned into indecision over what to order. Waffling between two fried appetizers, the arancini and the fried ravioli, I eventually decided to try the unusually stuffed fried ravioli. With a filling of ricotta, salami, and black pepper, these raviolis had a wrapper oddly similar to a fried wonton. 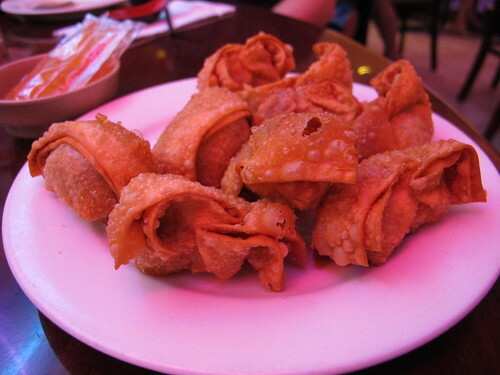 At first I thought I had received an odd order of crab Rangoon. However, there was a nice peppery bite to the filling that went particularly well with the few big chunks of salami. 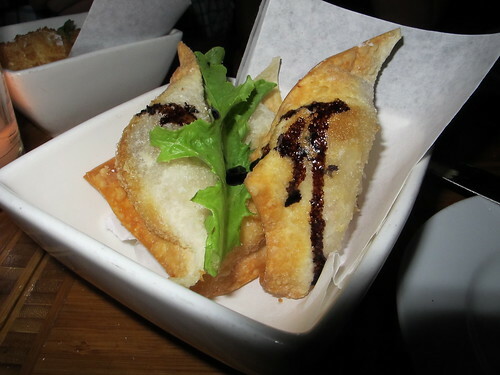 The drizzle of balsamic on top was a nice, tart touch that played quite well with the richness of the ricotta. Despite an enticing selection of entrees, I was dead set on trying a pasta dish. Sarah and Alex had raved about the quality of Trē’s homemade pasta and I was keen on trying one out. Pappardelle al ragu may seem like a mundane choice but this was a simple dish done well. 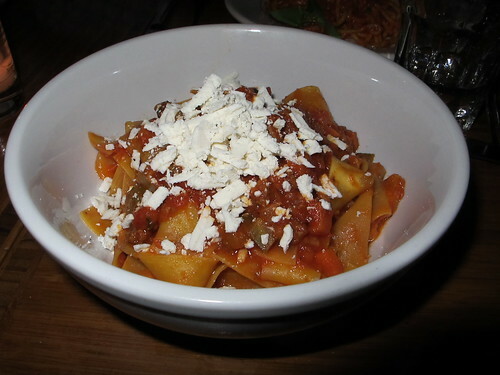 The tender pappardelle was well matched to the meaty, smoked ricotta filled ragu. One pleasant surprise to the dish was that each bite was met with a hearty crunch of celery and carrots, an easy addition but they made the dish much more enjoyable. There’s no air of pretention at Trē, instead it’s a close quartered, yet inviting atmosphere. 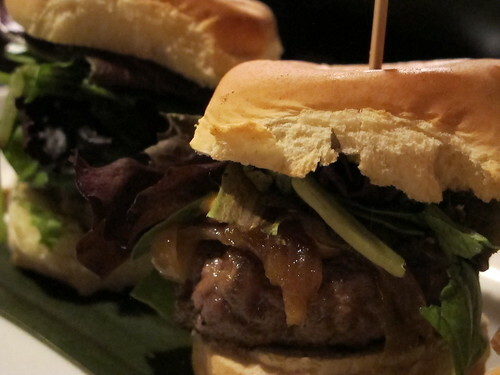 The food, or what little I tried, was approachable, reasonably priced and quite satisfying. Looking at Trē’s website, you might think that the tagline of “Food. wine. friends.” may be a bit hackneyed but Trē, for me, certainly lived up to that claim. Sarah and Alex may have discovered Tre on opentable by accident, but their subsequent returns and my introduction were certainly on purpose. Slightly hungover from the better half of a bottle of bourbon the night before, I was back in Chinatown. However this time I wasn’t looking for dim sum, but another favorite Chinese dumpling, the xiao long bao or the soup dumpling. Hoping some hot tea and dumplings would help assuage the alcohol’s effects, I ducked into Shanghai Café Deluxe if only because I had read about it on Serious Eats. Being a party of one, I was quickly shown to a table but with two couples. There wasn’t any friendly introductions or lively chatter, more people that just happened to be sharing a table and I was fine with that. Besides the constant throb at the base of my skull was more than enough of a companion for me. Thankfully my first order was out of the kitchen in a flash. Looking at these pictures now, I realize that I still had my camera’s white balance adjusted to flash but don’t let the oddly pink color fool you. 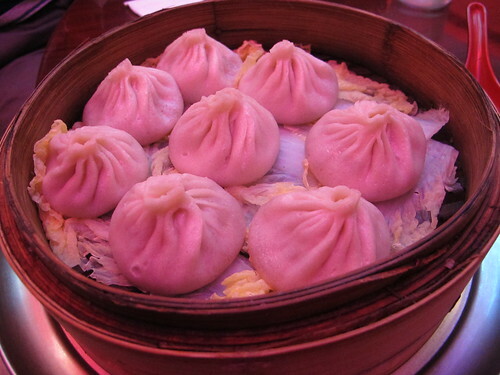 These Shanghai Style Dumplings had a thick, crunchy wrapper with juicy pork filling that packed a garlic & onion punch. As good as the dumplings and filling were on their own, the flavors were only more pronounced by quick dip in the accompanying vinegar sauce. While I was doing my best not to fill up on fried wontons, my order of xiao long bao arrived. Far from the fleshy pink in the picture, these dumplings had a thick, hand pulled wrapper that concealed a slightly sweet pork filling. Once I bit through the slightly dried out top, it was a mad rush of boiling hot broth. Like I previously mentioned the pork and broth were a little on the sweet side but they made for a dynamite hangover cure. Saturday morning in New York, surely it’s time for brunch. I can just see it now, eggs Benedict, hash browns on the side, a cup of coffee, a bloody mary, and the times on my kindle…life would be good. However, I chose a different approach to my late Saturday morning meal. I took a cab to Chinatown in hope of finding some quality dim sum. Several blocks of traffic later, I was dropped off on East Broadway and I made my way into the rather inconspicuous Golden Unicorn. After the usual confused stares at the request of a table for one, I was seated in the middle of the hustle & bustle of a weekend dim sum service. 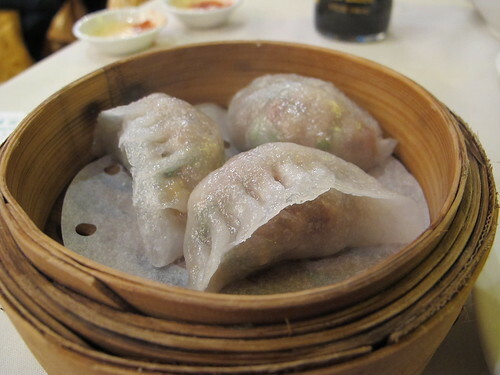 First on the table was an order of classic pan-fried dumplings. Thick skin, a crispy fried bottom, and a juicy green onion & pork filling, it’s your standard dumpling and a great start to the meal. A serving of crispy fried dumplings was next. Although the doughy, sweet pork filling had its charms, these dumplings had been on the cart far too long. Yellow egg dumplings joined in as dumpling number three. 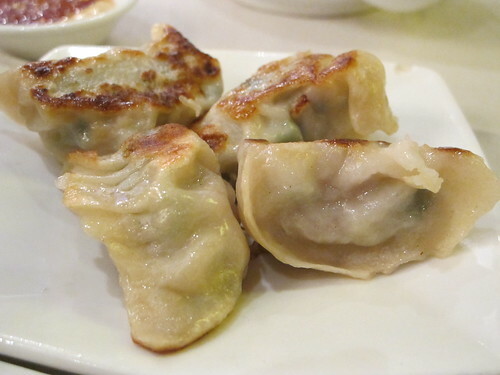 Also pan fried, these dumplings had a very chunky filling. 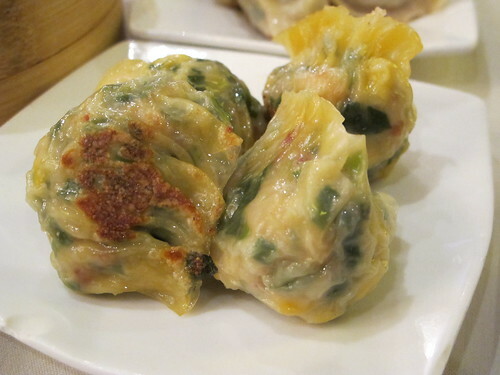 Even though they were quite satisfying, I can’t remember the last time I saw corn in a dim sum dumpling filling. 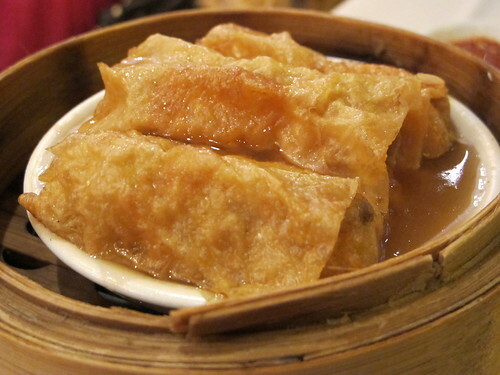 The best part about stuffed bean curd is the contrast between a crunchy filling and the soft, shearing quality of the bean curd skin, but these wraps had an extra bit of gelatinous mouth feel. I’m used to stuffed bean curb having a thick sauce, but this was like jello. 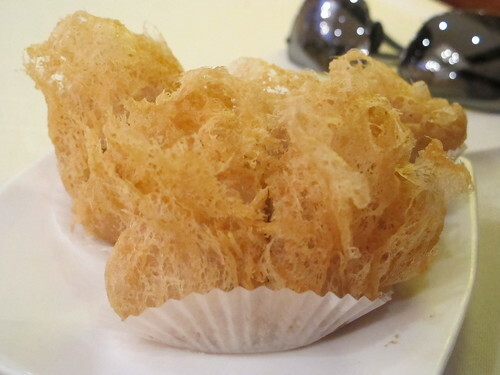 It’s impossible to eat a dim sum meal and not try an order of har gao. With an extra sticky wrapper and mealy, dried out shrimp filling, these were certainly a disappointing batch of dumplings. It’s not often that I encounter an inedible batch of har gao, but these fit the bill. 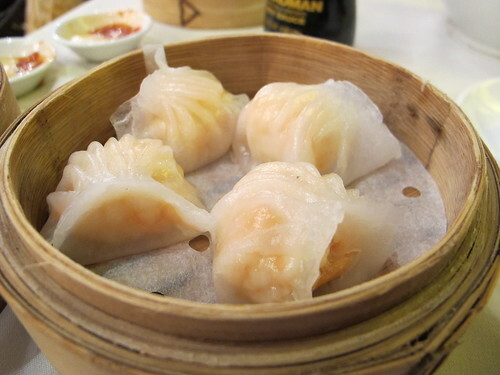 Along with har gao, siu mai is one my favorite dim sum litmus tests. Topped with a touch of roe, these shrimp and pork dumplings were juicy and greasy but just a touch overcooked. 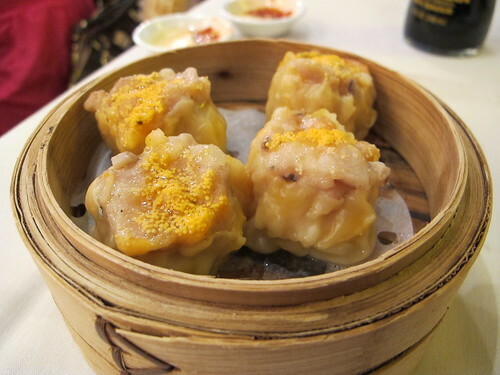 While certainly better than the order of har gao, these siu mai were nothing spectacular. Even though I had a variety of plates hall full of uneaten dumplings, I was looking for something a little different to try. When a waitress appeared with a cart bearing taro and pork dumplings, I decided to give them a shot. Beneath a thick, sticky wrapper was an oddly soupy filling that was heavy on the taro and very light on the pork. While I enjoy taro in odd dishes, this dumpling was not for me. I suppose that last comment on the taro & pork dumplings about sums up my meal at Golden Unicorn. While, outside of the har gao, there was nothing entirely unpleasant about the meal, it smacked of banality. A few items, namely the pan fried dumplings from the start, did satisfy my need for chili sauce, dumplings, and tea, but I felt mildly disappointed in what Golden Unicorn had to offer. I suppose the next time I'm in New York, I'll just look somewhere else for my dim sum dumpling fix.